The museum is the perfect setting for work-related activities, for socializing and for high level entertainment. The rooms, for their special characteristics, contribute to the success of any initiative. Businesses, clubs and private individuals can hold events in the spaces of the museum. The events usually take place after closing time (6 pm), but on special occasions a different time schedule can be arranged. The museum also is available for special events for the entire day on Mondays, when it is closed to the general public. The Grand Salon is the largest room in the museum, and was the formal reception room par excellence for the Bagatti Valsecchi family. 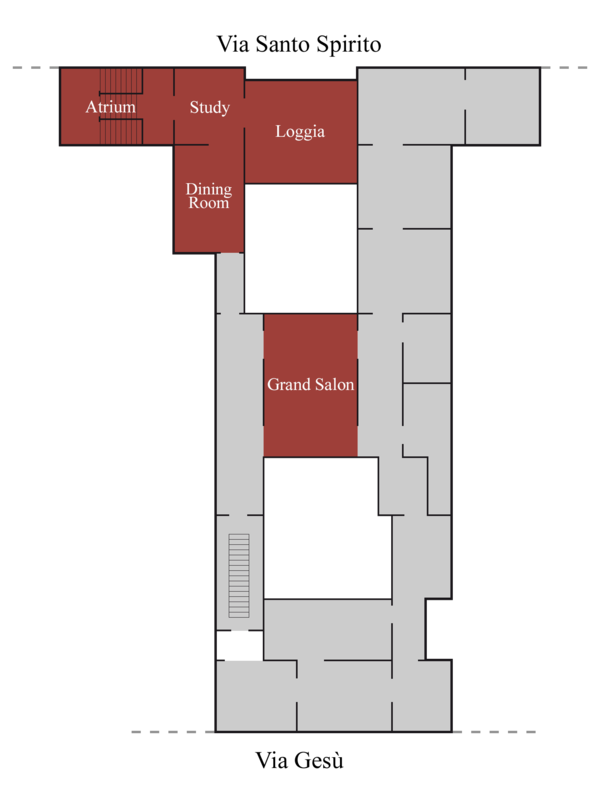 Suspended above and between two courtyards, it is the central point in the distribution of the mansion’s rooms. The dining room well represents the idea that animated the project of the Bagatti Valsecchi brothers: harmonizing collections and Italian Renaissance decor with 19th century furnishings in style. The façade of the mansion that gives onto via Santo Spirito is enriched on the second floor with a loggia with columns and by a semi-covered terrace ornamented with an elegant balustrade. First conceived as a place to meet those who entered the mansion from via Santo Spirito, in this room it is possible to get close to the taste and richness that characterizes the other rooms. An ample atrium on the ground floor of via Santo Spirito, from here one has access to a stairway in red marble from Verona and then to the other rooms shared by the brothers. This entrance once was partially heated by a fireplace—still in existence—in Renaissance style.